Kakunodate is a quiet, former castle town in the east of Akita. It is enclosed on three sides by mountains, and the Hinokinai-gawa River runs southwards through it. The original shape of the town was formed at the beginning of the 17th century, and from then on it developed as a castle town. The town has a refined ('miyabi' in Japanese), elegant feel ('iki' in Japanese) , and is called the "Little Kyoto of Michinoku." 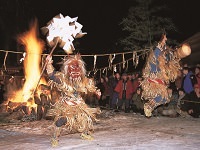 Many traditional events are held throughout the four seasons in Kakunodate. The town was built with two distinct areas, the samurai district and the merchant district. Once home to 80 families, the samurai district still has some of the best examples of samurai architecture in all of Japan. For those interested in the history of samurai, this is a perfect spot to stop by. 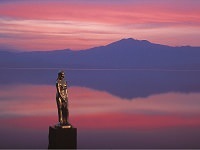 Kakunodate is also well known as the location of one of the Tohoku Region's most popular cherry blossom spots. Around late April and early May, large crowds of people come to see Kakunodate's special combination of pink blossoms and historic homes. 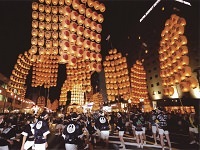 If you come at the right time you can enjoy: the Sakura-matsuri Festival (cherry blossom festival) in spring; the Sasara-mai Dance in summer, in which people dance while they rhythmically rub two 'sasara' bamboo whisks) together; the stirring Oyama-matsuri Festival in autumn, in which floats collide with one another; and the Hiburi Kamakura in winter, in which a straw bag on the end of a rope is set afire and swung around to pray for good health. 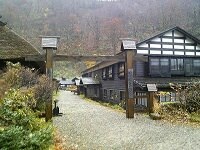 The collocation of ryokan in the mountain. 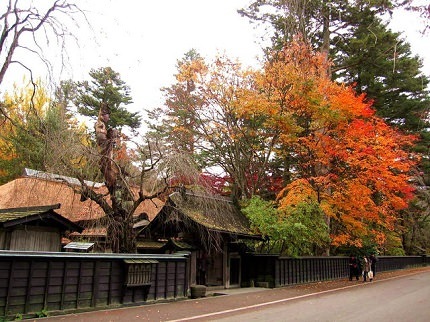 Tsurunoyu has over 300 years history.